Have you noticed how we hesitate to throw away an empty bottle of mineral water when its over? We always find another use for it either in the form of a water bottle to work, a juice bottle for your kid or a storage bottle in your refrigerator. Let's not argue about the fact that most of us have heard of its harmful effects on health, but have just turned a deaf ear towards it and continued refilling the bottle every single time it runs out! Well, the bad news is that we are in trouble. Apparently, most plastic bottles that are packaged with juices, water and other beverages should not be used more than once. The plastic contains traces of a chemical called Bisphenol A (BPA) that can interfere with the body's hormonal system. Where can you find it? You will be surprised to know to what extent we are all exposed to this chemical! It is present in plastic food storage boxes, plastic bottles, compact discs (CD), water supply pipes, food and beverage cans, dental sealants, baby feeding bottles, sippy cups and cigarette filters. On using such products over and over again, this chemical can start leaching into the food or drink it contains. Research in animals have shown a link between BPA intake and health problems like obesity, behavioral changes, diabetes, early onset puberty, asthma, cardiovascular diseases, reproductive disorders, prostate abnormalities, breast and uterine cancer, and genetic effects. Some studies in humans too have shown the effects of BPA to be damaging to health, especially in children. BPA affects female fertility especially in women suffering from PCOD and can further make conception harder. Early exposure to this compound can reduce the chances of fertility. In women going through IVF or any other assisted conception methods, exposure to BPA diminishes the success of the procedure. In males, BPA can result in a drop in the sperm count. It is important for us to look for substitutes soon. Using other alternatives like glass, stainless steel, aluminium or BPA free plastics can be safer in the long run. Give away plastic bottles to recycling stores and avoid using them as much as you can. 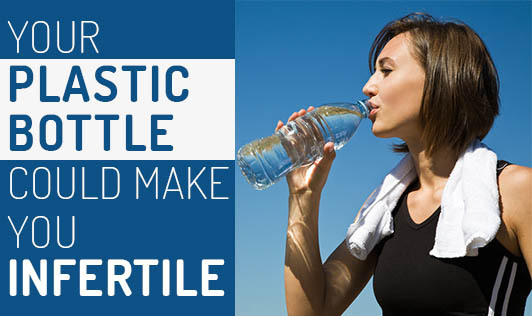 It is surprising how something as insignificant as your plastic bottle of water could be hampering with your hormones. Could this be the cause in the rise of infertility in both men and women around the world? Well, the reasons are many. However, knowing the facts can help you eliminate such factors that can have a detrimental effect on your health.